PASADENA, Calif. (AP) — Barack Obama is not leaving his presidency quietly. Obama also gave lengthy interviews to historian Doris Kearns Goodwin for a Vanity Fair feature and to Jann Wenner for his 10th Rolling Stone magazine cover. First Lady Michelle Obama gave Oprah Winfrey an exit interview and she’ll appear on NBC’s “The Tonight Show Starring Jimmy Fallon” on Wednesday. “I don’t remember (an exit) that has been as orchestrated and fulsome as this one,” said David Gergen, co-director of the Center for Public Leadership at Harvard University’s Kennedy School and an aide to four presidents. Gergen also can’t recall a president-elect who so forcefully promised to undo the achievements of his predecessor, so he understands Obama’s motivation to get his message across. 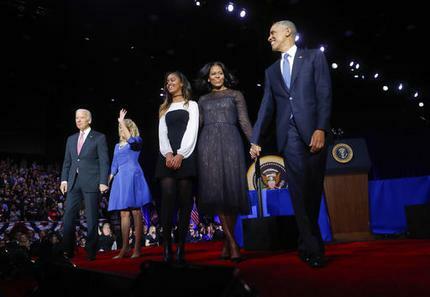 Obama was the 10th president to deliver a formal farewell address, and his speech in Chicago was the first one before a public audience, said Gleaves Whitney, director of Grand Valley State University’s Center for Presidential Studies. The first three farewell messages weren’t speeches at all – they were written and submitted to the press, Whitney said. Harry Truman began the modern tradition of televised addresses, which have been intermittently followed. Historically, farewells by George Washington and Dwight Eisenhower are considered the most impactful because they offered warnings to the country. Washington, in a message published in 1796, talked about how excessive political factionalism could threaten the nation’s unity. Former World War II commander Eisenhower, speaking in 1961, spoke about the danger of giving the military-industrial complex too much power. Obama spoke about dangers to democracy from within. But the traditional farewell is far from the only way Obama is trying to leave an impression. “President Obama has taken the legacy theme to a new level,” Whitney said on Wednesday. “The election of Donald Trump is the biggest rebuttal and rebuke that anyone can imagine. No one saw it coming. I think he and many people in his party are stunned by the rebuke. “He wants to squeeze every opportunity with the bully pulpit to make his case that, you know, the last eight years were not that bad,” he said. Obama is benefiting from the media’s sense of nostalgia that is common for exiting two-term presidents, said Gergen, also a CNN commentator. He’s leaves on a high note in popularity: a Quinnipiac University poll released Tuesday showed him with a 55 percent approval rating, compared to 37 percent for Trump. The president is also intent on spreading his viewpoint “because in the next few weeks there’s going to be a deluge coming the other way,” Gergen said. Television’s most popular newsmagazine, “60 Minutes,” will devote its full hour on Sunday to Steve Kroft’s interview with Obama that took place Monday in the White House. Kroft and Obama have a history: Obama gave him the first television interview after he was elected in 2008.